Sunday morning was most likely my last race of the season. 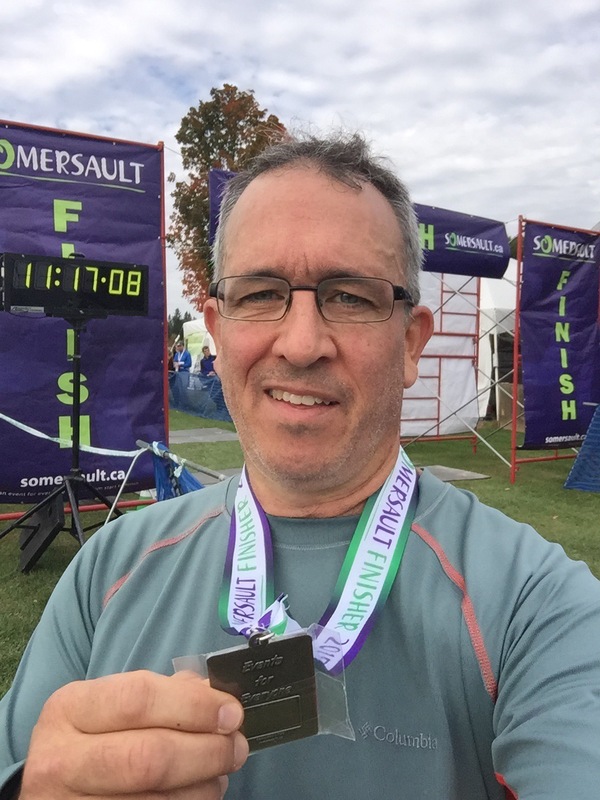 After hemming an hawing for a few weeks, the week before the race I threw my hat in to the ring and signed up for the Somersault Events Fall Colours 10k, one of the many races they held that day. As a first time participant of the event, I was really impressed by the organization of the day and the great family atmosphere. The race distances ranged from the kids’ Turkey Trott through to the marathon. Like all Somersault events, this day was very well planned. 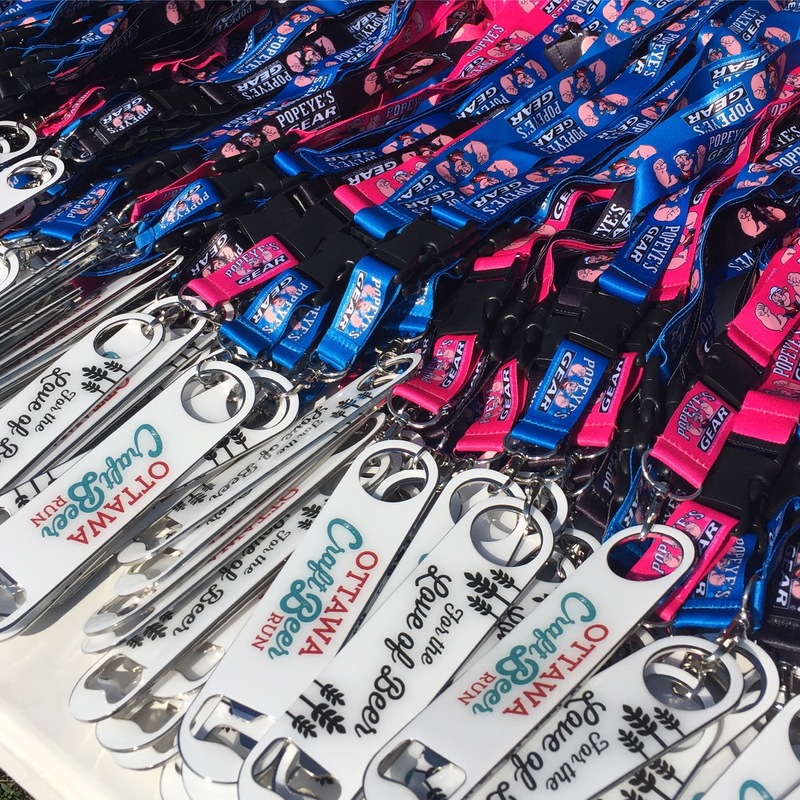 There was the pre-race emails from organizer Terry McKinty reminding participants about the start-times, facilities and amenities, and parking costs. They even setup a Facebook page for ride sharing. There was updates to the marathon route maps, and explanation about the colour coded markers for distances and directions. The water stations were manned by members of a local basketball club who were also beneficiaries of fundraising efforts form the day. The route was very well marked, and made its way from the Cumberland Heritage Village Museum and into a the community. Residents come out a cheer on the runners. All in all, it was a wonderful day. It helped that the weather was great; a bit of sun and not too warm. I chose a long sleeve technical shirt, but would have been fine in a t-shirt. Of course all of this was with a backdrop of trees that were nearly at the peak of colours change — hence the event name Fall Colours. My training for this event was somewhat sporadic. I had been running a fair bit this year as I trained for the duathlon in August. Also, I have been experiencing some real gains (losses?) in my struggle to reach my weight goals. Fortunately, iRun magazine partnered with SportChek and presented a series of 10 week training plans geared for October events — mybestrunningrace.com — and I was able to focus my training. Although I started out following the half-marathon plan, I soon realized that with the return to school and accepted that 10k was going to be a more manageable distance. As my training went on, my 5k times were getting pretty quick, and the one night I ran 10k, I was under 60 minutes for the first time ever. All that to say I was feeling pretty good about race day. The Fall Colours itself was a great run and experience. Learning from other races, I did not head to the back of the pack. Instead I went to the front of the pack to start the race. I knew I wasn’t going to be the fastest, but I also knew I wasn’t going to be the slowest. When the horn sounded, I headed out faster than knew I should running the first km in 5:10. Knowing that I couldn’t sustain that, and because I planned to finish around 60 minutes, I deliberately slowed down so that by the end of the third km I was hovering at the 6 minute/km mark. This was fine for me as I was trying to stick to my plan. 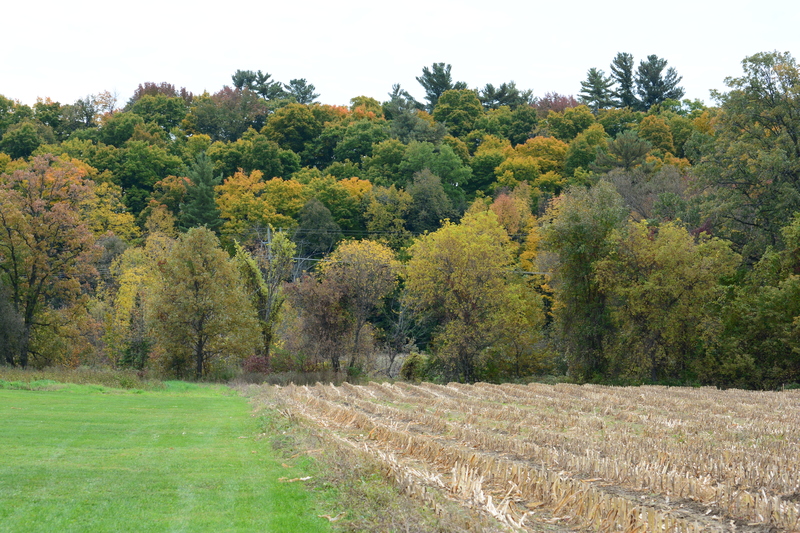 What I hadn’t understood, though, was how hilly the course is — in both directions. 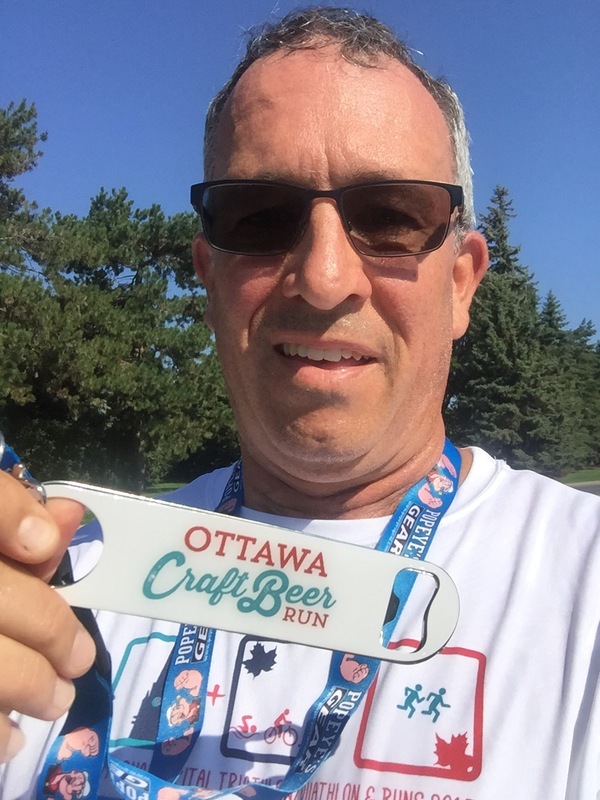 I managed to hold my pace, however, to the end of the 5km mark, and then I slowly started to pick up my pace, eventually getting back to 5:24/km, and running a negative split. Like I do in most races I pick another runner who seems to be about my pace and try to stick with him or her. This worked well again, and I managed to keep tabs on a few runners. However, because I was picking up the pace in the second half, I was slowly overtaking them. Nothing aggressive, but steady moves past various runners. As we headed into the final kick, I did overtake a few runners quite quickly. At the finishing chute, I picked up the pace even more — the last split time had me back at 5:10/km. My finishing time was 61 minutes, exactly 4 minutes faster than than my previous 10k race. I’m super happy with the race PB! But that’s not the entire story. You really have to admire and respect event organizers who recognize a mistake was made. More so, they own it; they didn’t blame the new guy. So what does this mean for my race and my PB? Well it means I got two PB’s that day. In addition to getting an official race time PB, even for a slightly longer distance, my actual 10k time was also a PB for me — 56:41! That is way faster (almost 9 minutes!) than than my previous 10k race PB, and it is faster than any other 10k I’ve run in training. For a race on Thanksgiving Weekend, I couldn’t really ask for more. Obligatory post-race selfie. These are rarely good! Swim: 600m in 17:30 Still worried about my foot — lots of foot massage and stretches to help loosen it. I did manage over 11K steps today. Nice, easy swim at the end of a very hot day felt great. Bike: 8.8 km in 19:42 (19:02 moving time) Bike ride getting a bit faster as the days go on, and I’m adding a bit more distance. Birthday dinner took precedence over my run. Pacer app says I walked more than 2.7 km over the course of the day so I will take that. Yoga: 10 mins Although the morning ride was pretty fast, the afternoon ride presented me with a pretty strong headwind (approx. 19 km/hr) so I didn’t make great time. Focused on consistent and strong pedalling form. After my run, spent 10 minutes using Yoga app to stretch out. MUST remember to do this everyday! Finished it all with a quick swim. Stretch:10 min The day was a complete right-off. I didn’t bike, run, or anything. I didn’t even reach 10k steps. I didn’t even eat particularly well. Argh! Swim or Yoga/Pilates class Walk: approx 1 hr. Bike was in the shop, daughter had field hockey, and we went out for dinner. running was not going to happen. Stretch: 10 mins House work and moving boxes counts as stretching, right? Stretch:10 min Walking and painting Some days, even though you have a good plan and everybody knows it, it just doesn’t happen. I did, however, spend a great day with my family and we got some things done around the house that were essential. Stretch: 10 mins Read an interesting article about the difference between Rest and Active Recovery that will help me through training. Swim: 550m in 14 mins Pacer app indicates 136 min active time approx 3.2 km. Too bloody hot for a run today 28C but feels like 35C with the humidity. The swim was a much better way to get exercise and stretch.. Stretch: 10 minutes First long ride of the year; lots of traffic stops. Will clearly need more time in the saddle at long distances to be ready for duathlon. Also had a nice 3k walk after dinner with my beloved. I finished the day with a quick swim to cool off. Pacer app counted 15214 steps. Run: 4.8 km in 28:30 I thought the ride was a bit faster; need to work on pedalling consistency. Two rides in the afternoon b/c of quick trip to doctors. first time running after a ride so I’m happy to have been on 5k pace under 30 mins. Should have run the extra 200m but my wife called. Family comes first. Bike: 8.8 km in 20:41 (20:41 moving time) Ride home was not as fast as I hoped but I pedalled the entire time, no stopping. Also had a couple of swims after work & dinner. My wife taught our daughter how to flip turn, and used me as the exemplar. I was surprised it came back to me so quickly. Saturday Rest Stretch:10 min REST & STRETCH I took it easy like I’m supposed to. the metatarsal bruising in my foot seems to be back so the break is good for me. So are the stretches and foot massages. Walk: 1.3 km in 15 minutes Family commitments kept me from following the plan today. I did go for a nice walk with the dog, and there was some light housework to do, but I didn’t get anywhere near my bike. This is good because my foot is still bothering me a bit and I want to be ready for race day. Article: What’s the Difference Between Rest and Active Recovery? Perfect time for me to discover this article as I learn more about training vs running. From Runner’s World site. What’s the Difference Between Rest and Active Recovery? 6:01/km AVG pace Just glad to be running again! Went out hard. 6:02 AVG pace Took it easier than yesterday, but still happy with progress. Tuesday Run/walk : 30 minutes. Swim: 10 minutes approx 250m free & breast Added new bike computer that syncs with Strava iPhone app so I have more accurate data. Still finding the best/safest route home — looks like I’ve got it. Nice refreshing swim when I got home. Walk: 3 km in 43:00 Didn’t get on the bike today, but I did manage a 5k PB. Also had a nice 3k walk with my beloved after dinner. A little over two weeks ago my ever enthusiastic and encouraging brother-in-law signed me up for the National Capital Duathlon organized by Somersault Events. While this is yet another vote of confidence of my athletic ability, it has forced my hand (or maybe my feet) to exercise and train for something. So with 7 weeks to go before the race I’ve been forced to research training plans for duathlons, a sport I know very little about. Yes I can run. Yes I have a bike that I used ride regularly. No I’ve never used them both on the same day with ANY organization or plan. When I did cycle, I was NOT a runner. My wife doesn’t think I need to practice the cycling component at all since I rode all the time when we were first together. Ah love. It does truly mask some things. Sure I rode all the time when we first together — 23 years ago! Yes this will require some training and work. It turns out the last two weeks have completely derailed any training plan I may have had. These were, as they are every year, two of the busiest weeks at work. Add to that a nagging heal injury that I was desperate not to make worse. Suffice it to say I haven’t done any planned exercise. I’ve been so busy my son has walked the dog more than I have these last two weeks. The only good thing is that I’ve had a little time to get my bike ready to ride again. 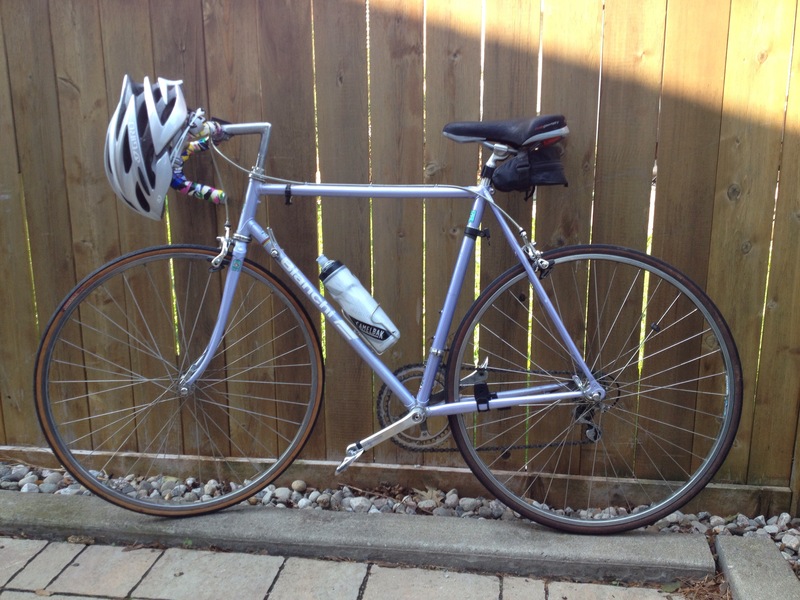 I bought this bike in 1987; it was a top of the line bike at the time equipped with Shimano 600 group of components. Moving from my old CCM bike to this Italian made Bianchi speedster was significant. During the summer I bought the bike, and the years that followed, I pedaled many kilometers each week exploring Ottawa’s neighbourhoods, the Gatinieau hills, and parts of the Quebec’s Eastern Townships. circa 1987 Bianchi Limited Edition — Ready to ride once again! As often happens, life got in the way — okay I got married and had a family so it wasn’t a poor trade — and I didn’t ride much at all. Finding myself a few weeks way from a 20 km ride is actually quite daunting. Do I still have the legs? Can I manged the distance in a time that doesn’t seem ridiculous? Can I remember how to get out of clipless pedals without falling over? With just five weeks to go before race day I actually managed to get out for a run. I try to take advantage of my daughter’s field hockey schedule to get my runs in, and Sunday was one of those days. On an unusually cool late June day (14C) I hit the trails behind Minto Field and pounded out a 6 km run with a 6:01 pace. I went out hard and managed to keep it up fairly well the entire time. It also meant I had a nice 1/2 km walk back to the field as my cool down. Monday was another field hockey night so I managed to hit the trails for another 5k run. I was a little slower on this run, but according to Strava I’m trending up for the route I took as I continue to get a little bit faster the more I run. I did finally get out on my bike. I had to go to a meeting so instead of taking the car I chose to ride. The distance wasn’t too great, just 8.5 km, so it was a good test to see if I have any cycling legs. I completed the ride to the meeting in 21 minutes, and the return was just under that time. Given the fact I haven’t ridden anywhere I feel these are pretty good times. I do hope to finish the race in under 90 minutes, but that is going to be a challenge given how little I’ve actually trained and prepared for the demands of a duathlon. The countdown is on with just 7 weeks to go before race day. In the first two weeks of training I did exactly no training. Nothing. I did, however, find a 10 week Beginners Duathlon training plan on the British Heart Foundation website that is manageable for me (Training plan). Of course I’m not going to have the benefit of all 10 weeks, but since I have been running, I’m going to jump in at week 4. Okay so now I’ve actually started running and riding again and I’m jumping ahead to week 6 of the BHF training plan. Except that I’ve already made some adjustments because of my plans for the week. I have covered the required activities for the first few days of the week, but in my own order. Monday was supposed to be a rest day, but I ran 5 km. Tuesday was supposed to be a 30 minute run day, but I biked 40+ minutes instead. And Wednesday is supposed to be a bike and run day, but since it’s Canada Day, and we have guests coming over, I’m unlikely to do anything. I will just have to adjust the rest of the week. That’s right, he signed me up for the event. I guess he knew I would keep putting him off or avoiding his suggestions/encouragement. For those of you who are unaware, the Sprint Duathlon is a 2k run, followed by a 20k bike ride, finished off with a 5k run. Sure, why wouldn’t I try this? Ummm … because I’m basically lazy! Alright, that’s not really a good description of me, although not far off the truth. 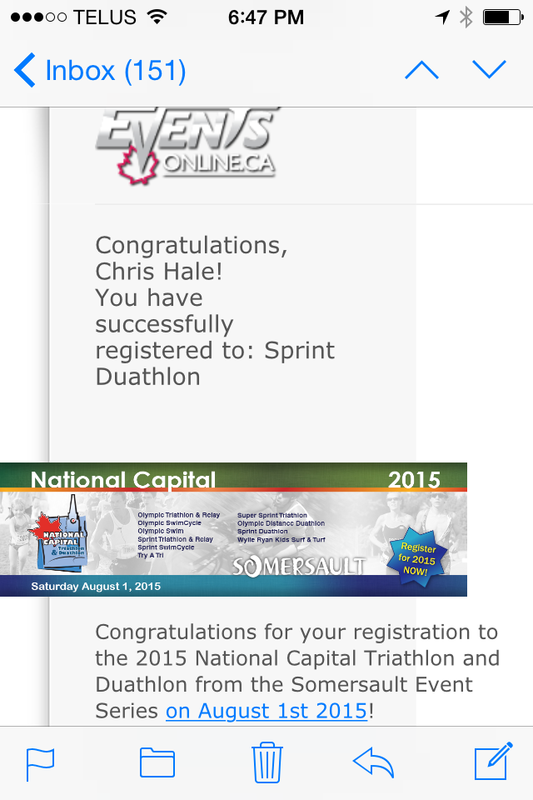 It really is a compliment from my brother-in-law since he does have faith I can actually complete a Sprint Duathlon. Besides, he was right about my ability to run my first 5k and my one and only half marathon. I think I really did myself in when I told him how much I had been running lately. What he missed, however, was the little point about me having not been on my bike yet this year. Oh sure I’ve had grand plans, but so far the bike is still in the basement on the trainer stand I DIDN’T use all winter. I really be testing the old adage about not forgetting how to ride a bike. I’ve got a few weeks to remember, but I think there’s more to this than just getting back on the saddle. Do you have any tips for training for a duathlon? Have you ever entered an event you might not be ready for?